In today's evolving market, development changes are requested more rapidly and the need for fast and efficient updated database versions are in high demand. For FileMaker Developers and Users, we are proud to announce the release of our newest product, 360Deploy. It automates and simplifies the process of rolling out updated database versions to a production FileMaker Server. It features a guided installation and setup process, a safe and intuitive method for data migration, and flexible pricing options. Furthermore, 360Deploy helps FileMaker developers cut back on downtime and the tedious labor typically associated with the deployment process. Click "one-button" to deploy, the rest of the process is hands-free! 360Deploy solves the age-old problem of making development changes on one FileMaker database and the need to merge updates with a live production database hosted on FileMaker Server. Current methods of working on a live file, writing script imports, or separating files to work can be undesirable, arduous, risk file corruption, or break an existing process. Imports: data is imported from the production database and into the clone to absorb the new architecture. *For large databases, it supports a scheduling feature to run imports overnight. Click here for an introductory video on how 360Deploy works! 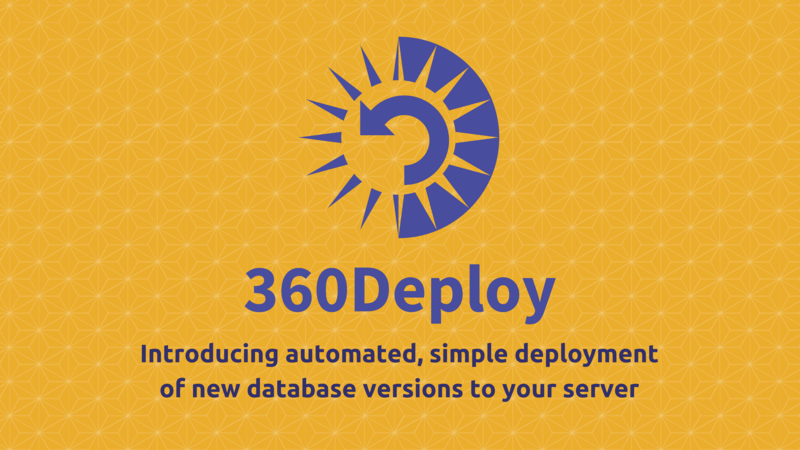 360Deploy is for anyone who wants to do development on a separate copy of their database, rather than risk making changes on a live production server. It is especially beneficial for FileMaker Developers with a vertical market solution. With a few simple steps, they can make a change on their development server and deploy the change to the live production server for their entire user base. FileMaker Developers in a single company will also find 360Deploy very useful. While the company utilizes a FileMaker solution in day-to-day operations, the developer can make changes that will not interrupt workflow. FileMaker Development companies can also benefit from the time-saving effects of 360Deploy - no more spending the day on tedious, lengthy methods to update a solution for customers! 360Deploy was previewed and demonstrated at the 2017 FileMaker Developer Conference in Phoenix, Arizona. The product received large crowds at demonstrations and a warm welcome, with developers describing it as "the only piece missing" in their FileMaker solution. Johan Hedman, another FBA Platinum developer, tweeted that "The 360Deploy product from @360Works is probably the best #FileMaker related product I have seen in many years." 360Deploy is available as a free demo and for purchase with a variety of license editions at 360works.com/360Deploy. 360Works Portfolio Bundle subscribers will receive an Enterprise license of 360Deploy included with their subscription at no additional charge.